It can be said that kneading is as old as the baking process itself. The dough cannot attain good functional properties unless the required ingredients are brought together and the resulting lumpy mass kneaded to form a uniform dough that is suitable for breadmaking. 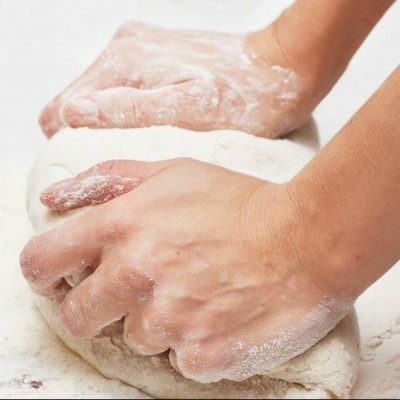 Hand Kneading: Takes 10–30 minutes to reach the optimal gluten matrix by repeatedly folding and stretching the dough. Dusting flour can be added to keep the dough from sticking, however, adding too much will dry out the dough and make it stiff. Mechanical Kneading: Takes 8-12 minutes and is the most efficient way to knead flour doughs. It uses a mixer/hook attachment set at a proper speed (rpm). Adequacy of kneading is determined using traditional gluten film test. Ingredient incorporation: Mixing of wheat flour and water, along with yeast, salt, sugar and other ingredients. Hydration of dry ingredients: Water absorption by the flour’s functional components (proteins, starch, pentosans) leads to gluten development and subsequent plasticization. Kneading: Development of gluten strands that gradually form the protein structure or matrix due to gliadin and glutenins binding together. Dough aeration: Incorporation of air into the dough in the form of gas bubbles and subdivision of existing air cells. Dough temperature: During mechanical kneading, significant friction between dough and bowl occurs leading to slight warming up the dough. Extensibility: Ability of dough to be stretched as the gas pressure from yeast fermentation builds up. Optimal dough should have good extensibility and minimal elasticity. An extensible dough is one that can be pulled into different shapes. Elasticity: Ability of dough to spring back when it is stretched. This refers to the degree to which a dough piece will attempt to regain its original shape after any deforming force has been removed. Tenacity (strength): Ability of dough to resist stretching or elongation forces. A dough with too much tenacity is difficult to machine during moulding and will not expand as much during proofing. Stickiness: Ability of dough to stick to surfaces. This property is often undesirable since it is responsible for makeup issues, and may require more dusting flour when hydration levels cannot be reduced due to process economics. Typically, doughs made with whole wheat flours require less kneading due to their low gluten content. Slack and sticky dough (dough too underdeveloped). Proofing will be slower presumably due to lower than optimal dough temperature. Baked product will have low volume, dense and firm internal structure. Baked product with sharp edges (too much pan flow in white pan bread). Dough will be too stiff (elastic) leading to erratic scaling (dividing) and poor moulding. Proofing will be faster presumably due to higher than optimal dough temperature. Baked product with round corners (poor pan flow in white pan bread). Internal structure of baked good will be dense and firm. Haegens, N. “Mixing, Dough Making, and Dough Make-up.” Bakery Products Science and Technology, 2nd edition, Woodhead Publishing Limited, 2006, pp. 310–320. Figoni, P. “Gluten.” How Baking Works: Exploring the Fundamentals of Baking Science, 3rd edition, John Wiley & Sons, Inc., 2011, pp. 136–151. Cauvain, S.P., and Young, L.S. “The Basic Principles of Breadmaking.” The Chorleywood Bread Process, Woodhead Publishing Limited, 2006, pp. 1–5.